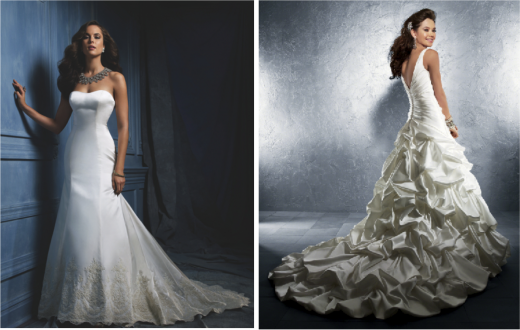 Choosing your wedding dress can be an extremely exciting and overwhelming task. 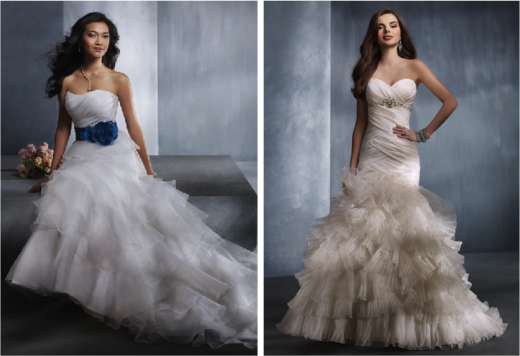 With so many different gowns to choose from, it can be difficult to know where to start. I normally recommend educating yourself on fabrics and knowing the ones you love- it will help narrow down your possibilities. Keep in mind that all fabrics look, feel and even sound different...they are definitely not all created equal. Satin is the most traditional bridal fabric and will always give you a timeless and elegant look that never goes out of style. Satin comes in a variety of weights and sheens and is perfect for a smooth line gown or gorgeously draped confection. Lace, in all its intricate patterns and delicacy, never fails to give a bride a classic or vintage feel. 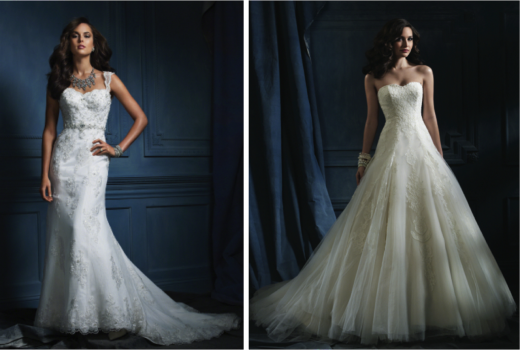 Glamorous with crystal beading, or majestic and royal on its own, lace is a versatile fabric. Originally a fabric only for royalty, lace has since become the quintessential fabric for purity, femininity and grace. Taffeta will give any dress a feminine quality and timeless look. Taffeta is a fabric that looks beautiful in a clean elegant silhouette, or as a fully draped ball gown. The most noteworthy quality of taffeta is its light as air feeling and soft rustling sound it makes as the fabric moves with you across the dance floor. I love that trends in wedding gowns are constantly changing, and organza is one fabric we are always trying to use in new ways. Organza is a crisp, sheer fabric that can be tailored into tiers, flounced into ruffles or even screened with prints. Wearing an Organza gown is soft, heavenly, and always sophisticated. Remember: Don't be afraid to try on a variety of fabrics. After all, sometimes you don't find 'the one' until you try it on!